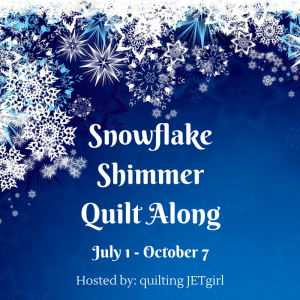 Yvonne @ Quilting Jetgirl ran a QAL for her Snowflake Shimmer quilt. I did some 'fancy' fussy cutting for my square in square blocks. I also downsized the quilt - these square in square blocks are 2 1/2 '' unfinished and the overall quilt is 18 x 22 ''. Perhaps not the best quilty metaphor here, but I think of this quilt as keeping all the craziness in the world in check - hence the quilt name Calming Chaos. The gray surrounding each of the islands of chaos. The quilting was a lot of fun. I went with straight line quilting and echoed around the shapes. I really liked the effect with the grid as lines intersected. Thanks Yvonne for a fun QAL! Make sure you check out my Elm Street Quilts Bag It event - fun way to earn chances to win prizes just for getting a head start on your holiday making! I'll be linking up my finish here. I'll also be linking up with Sew Cute Tuesdays, , Freemotion by the River, WIP Wednesday's, Let's Bee Social, Midweek Makers. Fabric Frenzy Friday, Finish it Up Friday and Finished or Not Friday. Such a fun way to fussy cut those fabrics!?! What a pretty little mini - the quilting is just the icing on the cake! I love this! The colors are great and the center squares...perfect! One of my favorites! I love that you turned yours in to a mini, it's so cute! Fuzzy cutting all those little centers was worth it, it looks great. This is beautiful. Love the quilting. Your quilt is beautiful! And the quilting is perfect--I may "borrow" the idea. All of my blocks are laid out, but I haven't been able to get it put together yet. Seeing the finished quilts is giving me encouragement! Wow. That fussy cutting is a wonderful effect. Love the colors and how it all came out. Great quilt. I love how your quilt turned out. The fussy cut squares really add dimension to your quilt. Your fussy cutting that fabric really makes it shimmer! Well done! What an amazing quilt!! The center fabric really does make the quilt shimmer. It's a great addition to the solids. Very pretty mini! Those square in a square centers do look like chaos! It is so exciting to see how you successfully downsized the pattern, and I love the straight line quilting. Thank you so much for sewing along with me! 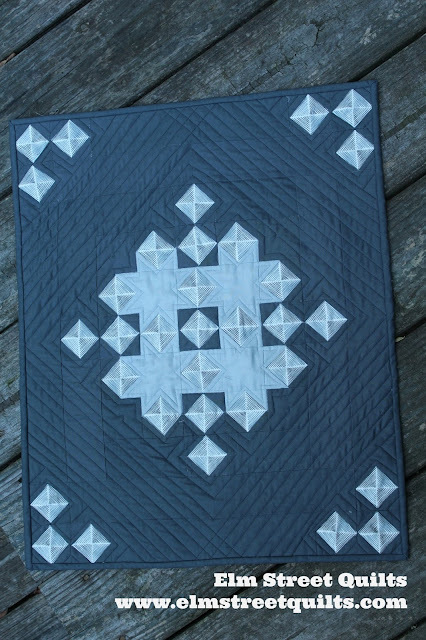 WThats such a fun way to add a little something to the quilting, the extra lines really make it pop and the whole effect is just gorgeous! Islands of chaos...love it. I teach so I must live on the big island! In all seriousness though, I love this quilt. That shimmer design is gorgeous! It really is perfect for a snowflake! Love the effect! Love it. Now I want to make a mini one. Love your choice of fabrics and quilting ! Great job !